Your office is getting ready to launch its new employee badge program, and you need to buy new ID badge holders. When it comes to choosing this common ID accessory, many people will have only a vague idea of what they need: "some plastic thing to carry the card, and then a way to wear it too." Accurate, but not very helpful! 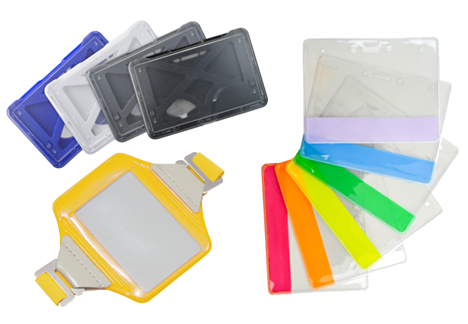 In many cases, people are unaware of how many options there are for something as simple as an ID badge holder. Think of all the possibilities: Rigid. Flexible. Color. Clear. Shielded. Multi-card. Arm-band. Credential wallet. Premium vinyl. The list goes on and on. It's enough to overwhelm any shopper, and definitely makes the buying process much more difficult. However, it's a lot easier to zero in on the perfect badge holder for your needs if you're able to narrow down the list of options by asking yourself a series of qualifying questions. While the questions below might not land you on that one perfect badge holder, answering them will help you end up with a smaller list of potential choices. Once you've gotten to that point, you can compare the remaining holders by more detailed criteria, like price, minimum order quantity and shipping time, to get the exact one that meets your needs. 1. What kind of card are you carrying? While all badge holders are designed to perform the same basic function (carrying an ID card), you're going to have different requirements depending on the card that's going inside the holder. If you're using a magnetic stripe card for your employee ID badges, you'll want a holder that makes it easy to swipe the card. Options here include things like a holder with a thumbnotch for easy card removal. 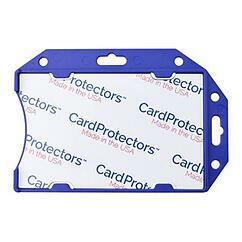 If you're using smart cards, you'll probably want to consider using a rigid badge holder. Rigid holders help prevent the inserted credential from bending, which is key for technology cards: bending can ruin the internal chip that powers the smart card. 2. Are you concerned about identity theft? Data theft from smart cards, known as "skimming", is a serious issue. Nefarious characters armed with readers are, in some cases, able to duplicate credentials from feet away, potentially giving them unfettered access to your site. One way to prevent this is by using a shielded badge holder, which uses a thin piece of metal to prevent the inserted card from being read. If you're using smart cards for both ID and access control, you'll need to think about whether or not you want to be protected against this form of data theft. 3. How many cards will you be carrying? For most people, a badge holder that has room for one card is enough. However, some organizations issue multiple credentials, like one for ID and one for payments in the company cafeteria. If your organization only needs to carry a single card, you'll have hundreds of holders to choose from. If your organization is looking for a multi-card solution, you'll be able to narrow your search down to items like the 3-Card B-Holder or a credential wallet. 4. How do you want to wear it? A badge holder can be worn in several different ways. Some come with a metal clip that attaches to a shirt or pocket. Some feature a slot that requires the purchase of a separate accessory for use. Others feature chain holes that allow them to be worn around the neck, while still others have arm bands. Deciding how you want to use your ID badge holder is a big step toward finding the correct one for you. If you're looking for a one-item solution, go for a badge holder that features an attached clip. However, if you're also looking at using something like a custom badge reel with your holder, you can expand your options accordingly. Still looking for that perfect badge holder? Our online badge holder selector tool makes it easy to find a great ID badge holder for all needs. Our tool allows you to choose the features that matter to you and then shows the badge holders that meet your needs. Plus, you'll save money: all online orders of more than $99 ship free!